See, making Lo Mein on the stovetop is fast, but it’s kind of a pain. There are the noodles to cook so you need a pot of water to bring to a boil to cook the noodles (and drain it) and you have to watch them closely to get them just right or you’ll have Lo Mein mush. And then there’s the stir-frying which is always fast and furious. It doesn’t take a long time to make a stovetop Lo Mein, but it IS intense time. Wouldn’t it be great if you could dump everything in the IP and push a button? And then walk away and do what you need to do while dinner cooks? Well, it IS almost that easy, but it turns out making Instant Pot Lo Mein wasn’t quite so straightforward as I initially thought it might be. I don’t think any Instant Pot recipe has given me so much angst. Well, maybe hard-boiled eggs. They rate right up there on my pain in the patootie scale to master. But back to the Lo Mein. Trying to get gorgeous, fresh tender-crisp veggies done in the same pot as the noodles took a bit of finagling. So my recipe has a little secret. It involves a foil packet. But follow along and your Fast Fresh Instant Pot Lo Mein will be a game changer, made all in one pot and better, even than takeout! 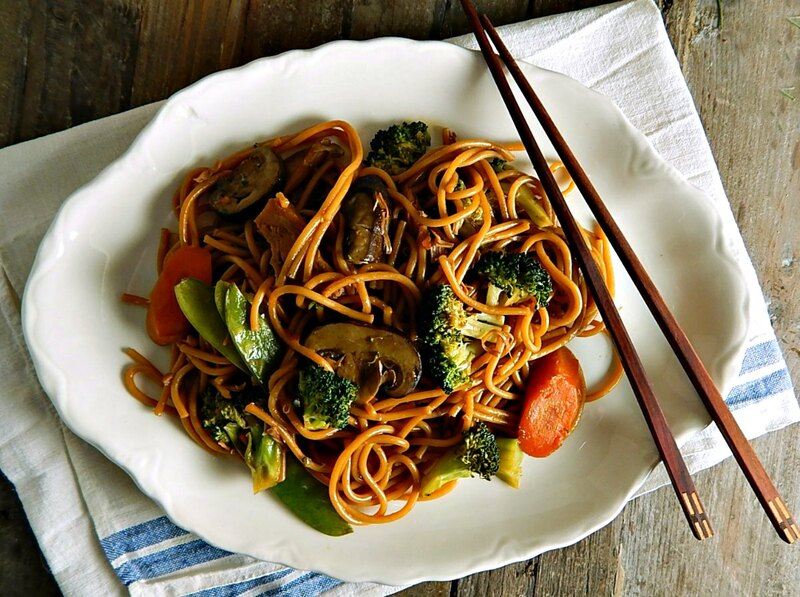 A big plus is that there is only a bit of sesame oil for flavoring, so Fast Fresh Instant Pot Lo Mein is SO much healthier, and of course, you can customize pretty much everything to your exact taste when you make your own Lo Mein. Keep the sauce the same though, it’s the bomb. The bomb dot com. Now if you’ve cooked in the IP, you gotta know that the shorter recipes are sometimes trickier than longer ones. There’s little room for error when you’re cooking at three times the speed for just a few minutes. So let’s talk about the components of this Fast Fresh Instant Pot Lo Mein and how cooking them translates to the Instant Pot in a way that’s going to make each part of the Lo Mein shine, the noodles, the veggies, and the sauce. The first issue I ran up against in my Instant Pot Lo Mein was the noodles. They need a good amount of liquid to cook in. Like way more liquid than you might want in your Lo Mein. So my solution is to take a page from other Lo Mein I’ve made on the stovetop. On the stovetop, I take my very al dente noodles and finish them in the sauce in the skillet. In the Instant Pot, I do basically the same thing for my Fast Fresh Instant Pot Lo Mein. Cook the noodles just shy of al dente, take the lid off and push the Saute button. Simmer the Lo Mein, stirring often which will break up your noodles (they tend to clump in the IP) and let the noodles absorb most of the tasty sauce. It only takes about two to three minutes. It turns out that the five minutes it takes to cook the noodles in the IP (remember that’s the five minutes under pressure, not including the heat up and the quick release) overcooks all but the sturdiest of the vegetables. And I wanted a Fast Fresh Instant Pot Lo Mein with beautiful tender-crisp veggies. And I so wanted to find an easy way to make everything in the same pot (that’s the whole point of the IP, right?) so I came up with a workaround. I divided vegetables into three categories, Sturdy, Delicate and Very Delicate. The sturdier ones are laid in an even layer on top of the noodles and that helps the noodles cook without drying out because those veggies give up their moisture as they cook. The Delicate vegetables are wrapped in a protective foil packet with a tablespoon of water and added last. That foil packet helps protect the sturdy vegetables, right underneath them, too. The Very Delicate veggies or ones that are already cooked are stirred in during the final simmering phase to just heat through. That’s a great time to add any leftover vegetables you’d like to use in your Instant Pot Lo Mein, too, along with already cooked chicken, turkey, beef or pork or tofu. Make sure to follow the cutting instructions pretty closely because that will affect how the vegetables cook. The foil packet needs to be made out of regular foil; heavy duty foil insulates them too much and they won’t be cooked through at the end. When the pressure is released, check the packet of the veggies and make sure they’re cooked to your liking. If they need a bit more time, toss them into the IP as you do that final simmer. There are so many vegetable options that can be added to your Lo Mein. I haven’t tried them all yet; so far I’ve only cooked green onions, carrots, broccoli, mushrooms, and snow peas. Based on that, I’m taking an educated guess that the sturdier veggies should be cut a little thicker than normal and the delicate veggies just a smallish bite-size, so take the below as a guideline. If you make my Fast Fresh Instant Pot Lo Mein, I’d love to hear about what veggies you’ve used, how small or large you cut them and how they turned out! In this particular Fast Fresh Lo Mein recipe, I add in already cooked protein, about a cup and a half of chopped or sliced chicken, turkey, beef, or pork (or firm tofu) to the Instant Pot during the final simmering, just to heat through. Or if you’d like, smallish raw shrimp can be added, and are small enough that they’ll cook through during the simmering process. I made this particular Lo Mein with leftover Thanksgiving turkey. If you would like to cook your protein just for this recipe, you can simply saute it with a little oil until done or marinate it, as I did in my recipe for Steak Lo Mein, then saute it. While using any leftover meat makes the Lo Mein much faster, if you’re starting from scratch and cooking it, you do have the chance to inject a little more flavor with the marinade. Either way is a win/win as far as I can see. 🙂 I haven’t yet added any raw protein to my Instant Pot and cooked it through with the noodles and veggies; I’ll update you if I do. 1 to 1 1/2 cups chopped cooked turkey, chicken, beef or pork or a cup of small shrimp, cooked or not. Spray bottom of Instant Pot liner with cooking spray. Break spaghetti noodles in half and add in several layers, each layer at right angles to the previous layer. Add water and sauce ingredients to the instant pot. Do not stir but push down or spread out any noodles that are sticking above the sauce. It’s ok for the very top of the noodles to be just even with the liquid. Add carrots and mushrooms in an even layer (as possible) on top of the noodles; try to make sure the noodles are covered as best as possible by the noodle layer. Make a foil packet for the more delicate vegetables: Place the broccoli and snow peas in the center of a piece of foil. Add a tablespoon of water and fold foil around the vegetables to form a packet, sealing tightly. Place packet on top of carrots and mushrooms. Seal Instant Pot and set for High Pressure for 5 minutes. (It will take a few minutes to come up to pressure; be patient.) Immediately Quick Release when finished, remove the lid and press the Cancel button and then press the Saute button. The noodles will still be stiff and there will be quite a bit of sauce. Open up the foil packet to determine if vegetables are done to your liking. If they need more time, add them to the Instant Pot to finish off in the next step. Add cooked turkey to the Instant Pot. As the contents of the Instant Pot comes up to a boil, stir with a large spoon, breaking up any clumps of noodles, making sure to turn over everything that’s at the bottom of the pot. Continue to simmer, gently stirring as needed until the noodles are at the desired doneness and sauce is mostly gone, two to three minutes. The noodles will continue to absorb more of the sauce as they sit. Add in the vegetables from the packet if they haven’t already been added. Serve immediately, garnished as desired. Note: This recipe has only been tested in a 6 quart Instant Pot using exactly 8 ounces of noodles (half the box) and the exact amount of liquid. Changing those proportions may change the outcome. I’ll be sharing my Fast Fresh Instant Pot Lo Mein at Fiesta Friday #252, and the co-hosts this week are Alex @ Turks Who Eat and Zeba @ Food For The Soul. Stop by and check out Fiesta Friday and Alex and Zeba’s sites; you’ll love them all! This entry was posted in Click here for Bargain Meals, Click here for Fabulous Food Posts and tagged Asian, Broccoli, Carrots, Chinese, Instant Pot, leftover turkey, lo mein, mushrooms, noodles, Pasta, snow peas, spaghetti. Bookmark the permalink. Wow! This was really good, and really easy! Thanks for doing the work to figure out how to get lo mein right in the IP. Even my daughter (who is “so tired” of “only ever having chicken or Mexican food” from the IP) was impressed! This is a keeper, for sure, and I can’t wait to experiment with other veggies. Hi Tracy, thanks so much! You made my day! I’m a firm believer that the old Ip doesn’t always have to be a “blunt” instrument reducing everything to shreds (but I do love how good it does that!) but can be “fine tuned”, too! I’m always experimenting, too…but only the best gets put up here…I think this is one of the best of the best!! Thanks much. Lo Mein is always fun. Good tips you have for us in this post. I’ve never thought of making a Lo Mein in our IP. I think it beats takeaway and that’s usually what we have. IP hard boiled eggs, I do 6 eggs, cup of water, 12 minute low pressure cook, 10 minute NR and the into an ice bath which grand results. I like making lo mein and love to change up the veggies and sauces – keeps it exciting. Funny thing about those eggs, I never had a problem cooking a few eggs in the IP but when Easter rolled around and I wanted to do a dozen, I had fail after fail. That’s why the post! This looks delicious. I am going to have to do a little research to see how I can ketofy it! I’m sure you could with some kind of veggie noodle and I don’t think the sauce would be too difficult, but then it’s so quick to make you wouldn’t want to bother with the ip! 🙂 Do you know I saw recipes out there with 1/3 cup and 1/2 cup of brown sugar in the sauce? Yikes! I have whole wheat lo mein noodles. Any ideas how this might change the cooking time/process? Sophie, this recipe is so easy and adaptable that I think it would be just fine. Just half the time you need to get to al dente (should be on your package) for the high pressure part of the cooking, and then QR and bring it to a simmer till the noodle is cooked just how you want. I worry sometimes that whole wheat doesn’t have as much elasticity as other noodles but since the final cooking is done by simmering I think it will be just fine. I’d love to hear how the recipe works for someone else, hint hint!! 🙂 If you give it a try, let me know! Hi Angie, thanks much! And thanks for adding the photo to pinterest! I never think about doing that but I will from now on! This sounds amazing. I absolutely love lo mein. I recently acquired an instapot after gifting it for a bridal shower only to find out they had already received several at their shower. I am a bit nervous to give it a spin, but this seems pretty simple! Wow! They got several, lol! See how popular the IP is getting. You just have to dive into it! I’ve been meaning to put out my own So you just got an IP post, but check my right sidebar – there’s a few other IP recipes there, too.